Metal halide lamps and high-pressure sodium lamps are used. The lights can go up and down so that they can be adjusted accordingly to the rice growth. In this environment, rice can be harvested three times a year. A gentle breeze is imitated through a fan. This prompts pollination and also lowers the temperature in the room. The state – of- the art farm, known as Pasona O2, was created by Tokyo- based temporary staffing agency Pasona Group Inc. and was set up as a means of providing agricultural training to young people who are having trouble finding employment and middle-aged people in search of a second career. In the absence of sunlight, the plants are sustained by artificial light from light-emitting diodes, metal halide lamps, and high-pressure sodium vapor lamps. 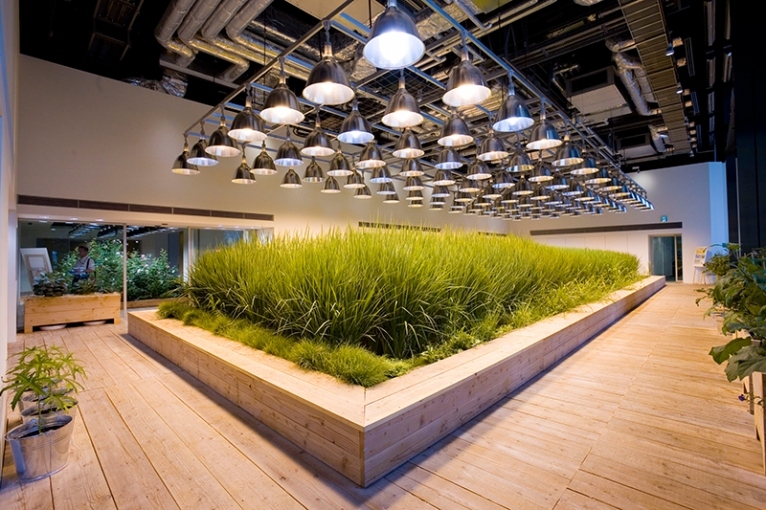 The temperature of the room is controlled by computer, and the vegetables are grown by a pesticide-free method in which fertilizer and carbon dioxide are delivered by spraying. Hydroponics, in which plants are grown in water and hardly any soil, is one of the methods of cultivation used in the facility.